Reduce your total fluid expenses, maximize floor space, and provide safe and efficent storage for bulk oils, lubricants, hydraulic fluids, ATF, anti-freeze, and DEF. Tote-A-Lube tanks are constructed from UL rated food-grade polyethylene resins and the transparent tanks offer a visual inventory of fluid levels. The patented easy-fill design ensures easy filling to each tank within a stacked system. Tank Openings – (1) angled fill port with a 2in. NPT poly cap, (1) 2in NPT plug, (1) 1in. NPT stainless steel dispense fitting. 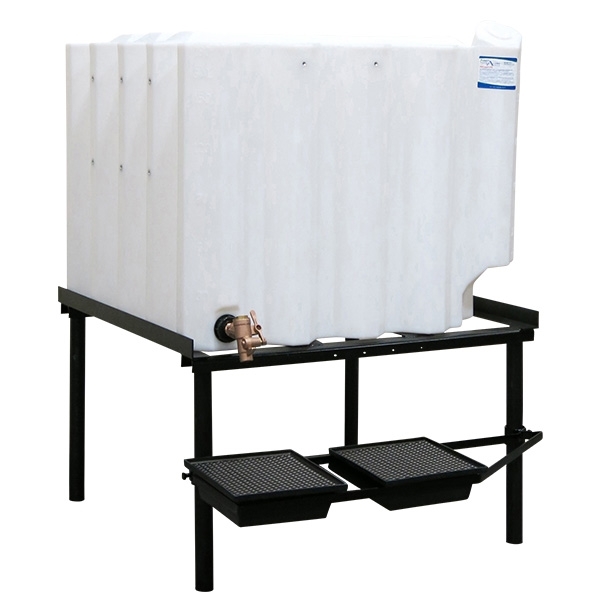 The T120 Tote-A-Lube tank also has (4) 3/8-16 molded inserts on the top surface of the tank, which secures dispensing accessories (universal dispensing equipment can be purchased seperately). Secure a placard within the (2) 1/4 front molded tank inserts.